Relay for Life 2014: the weekend is here! 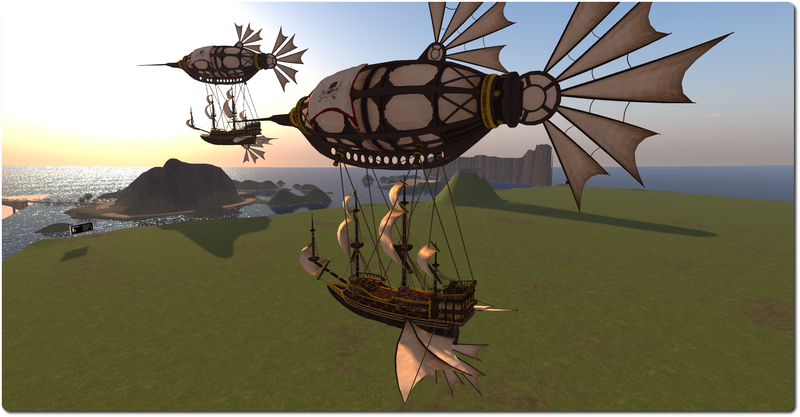 The 2014 Relay for Life weekend in Second Life is upon us, and with over $300,000 USD already raised this year, it look like the weekend is going to be a scorcher. The theme for the weekend is Journey of Promise. As with previous years, the weekend will be focused on the 42-regions Relay Track and activity regions and the American Cancer Society region. The aim this year is to raise $401,000, with $382,000 already raised. 401 is the form used to mark retirement in the USA, and the plan is to retire cancer! The following are the main events scheduled for the weekend – but remember that there are relay laps, entertainment and more going on across the entire weekend. All times are, as usual, SLT. 18:00: PIRATES – pull out your eye patches, pirate hats, scarves and more! 22:00: MOST COLOURFUL – how many colours can you wear? 23:00: 10TH ANNIVERSARY – ONE TEAM! 01:00: HOPPY BALL BOUNCE WITH US – bounce around the track! Find your hoppy balls in the Relay Info Stations! 06:00: Fight Back – make that pledge…what will YOU do to fight back against CANCER? 08:00: COFFEE AND DOUGHNUTS IT’S BREAKFAST TIME! At 21:00 SLT on Saturday July 19th, the Luminaria Ceremony will talk place. The track regions will all be set to midnight and thousands of luminaria will be lit, each one representing a survivor or someone who has passed away from cancer. People are invited to walk the track in silence for one hour as dedications are read over the broadcasting stream. 06;00 SLT on sunday July 20th will mark Fight Back. Pick up your specially made FIGHT BACK ARMY CAP and Fight Back Flags – available at the Relay Stations, and join us as we make our fight back pledges to save a life this year; your own, a friends, a family member, or someone you don’t even know yet. The best place to start is the Welcome Area, particularly if you’ve not participated in the RFL of SL weekend. Here you can pick-up your track tools, which will record the distance you walk around the track and allow you to chat with friends and those around you and walk at the same time. You can also obtain a reference guide to the luminaria donation colours and detailed of the themed laps for the weekend. Greeters will also be on-hand to answer any questions you may have. Once you’re ready to go, use the teleport to get to the track regions. On Friday July 18th, the Lab launched the latest off of its Premium Membership discount offers, together with a new Premium Membership gift. These seem to be run around July / August each year, and also in November. As usual, the offer is 50% off of membership for those upgrading, but only if they opt for the Quarterly billing plan, and the discount is applied only to the first quarter billing period. The offer runs from 08:00 SLT / PDT on Friday July 18th 2014 through until 08:00 SLT / PDT on Monday August 4th, 2014. The usual Premium Benefits are part-and-parcel of the offer. I’m a Premium Member; I re-upped several years ago after having been basic, and I find it moderately useful – for I time I lived exclusively in my Linden Home and didn’t find it that bad; admittedly, I managed to land on my feet with the one I had, but I did spend a fair amount of time mulling things over and settled on the exact style I wanted ahead of time and then dallied until it came around on the booking page (not all variants of the various styles are available all of the time). I was then very lucky that the first one I saw was in a location I liked – however, moving between Linden Homes is relatively simple, providing you follow some simple rules. So if the first one you are assigned doesn’t fit the bill, location-wise, it’s easy to hop around. Even so, I’m still (as always) irked by some of the stated benefits that come with Premium, and wish the Lab would clean-up some of the wording – “More Land and Privacy?” – how, exactly? Basic members get to enjoy both of these as well; not as cheaply, perhaps, but they can have them. I’d also like to see more thought given to the benefits in general. some of the gifts are fun … but none of them are that inspirational. Pirate, eh? 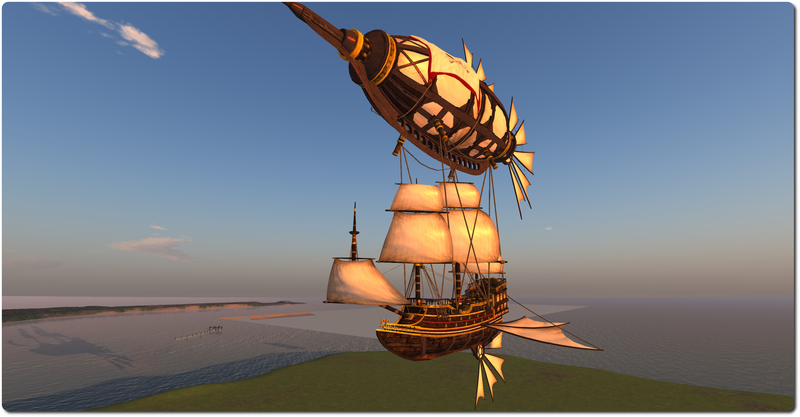 All I can say is avast … land impact goes into this vessel; 502 in fact (although the physics weight is admittedly only 18-ish), so it’s not something you’ve going to want to keep rezzed out somewhere. It’ll sit a number of people – Captain (owner) at the helm, who must board first, then the “First Mate” and then passengers (or “scurvy crew”, if you prefer and keeping to the piratical theme. Flight controls are the usual : PAGE UP and PAGE DOWN to ascend / descend, LEFT ARROW and RIGHT ARROW to turn. UP ARROW and DOWN ARROW to accelerate / slow down. A nice touch is SHIFT LEFT ARROW or SHIFT RIGHT ARROW to run-out the port or starboard cannon on the gun decks and fire a broadside.